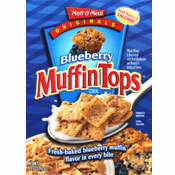 Blueberry Muffin Tops was introduced under the Malt-O-Meal Originals branding label. According to the box, the cereal has "Fresh-baked blueberry muffin flavor in every bite." The box also notes that the cereal is a "Good source of calcium!" and that it's a "whole wheat and rice cereal with real blueberries and natural and artificial flavors". According to press propaganda released with the cereal's introduction: "Malt-O-Meal cereal has long been known for their cheap solutions to big name brand cereals, but there is nothing cheap or second rate about their new Blueberry Muffin Tops cereal. Malt-O-Meal captures the taste of fresh blueberry muffins almost perfectly and does a wonderful job of making it into a delicious cold breakfast. Malt-O-Meals Blueberry Muffins Tops cereal is a great value as compared to any other major brand, costing a dollar or more less then a small box of "name brand" cereal, and you always get 30% more with Malt-O-Meal." 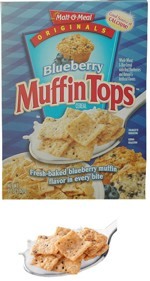 In 2007, Malt-O-Meal introduced Blueberry Muffin Tops Cereal Snack�ers 100 Calorie Packets containing a small amount of the cereal intended for use as a dry snack food. Vitamin A (10%); Vitamin C (10%); Calcium (10%) Iron (25%); Vitamin D (10%); Thiamin (25%); Riboflavin (25%); Niacin (25%); Vitamin B6 (25%); Folate (25%); Vitamin B12 (25%); Phosphorus (8%); Magnesium (2%); Zinc (25%); and Copper (2%). The first five ingredients listed under the cereal's nutritional facts: whole grain wheat, sugar, rice flour, partially hydrogenated soybean oil and fructose. On January 24, 2007, scary-crayon.com voted Blueberry Muffin Tops their "Best Dollar Store Cereal That I Purchased 2006". Click here to see all cereals from Malt-O-Meal. What do you think of Blueberry Muffin Tops? 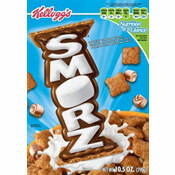 I need this cereal back in my life! Please bring back the Blueberry Muffin Top cereal. I really miss them. Please make them again. I really want to buy them again. I have been looking all over for this cereal. I died inside when I found out it was discontinued. PLEASE PLEASE bring it back! MY FAVORITE CEREAL EVER! I was HEARTBROKEN to see when it was discontinued. It's so unfair. I'm about to start a petition to bring it back. My FAVORITE CEREAL EVER. Someone start a petition to bring it back. My son and I love this cereal! Please bring it back. Best cereal ever besides the strawberry creamery one! 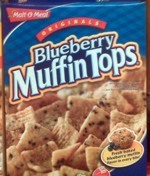 Please bring back Blueberry Muffin Tops! Best blueberry taste of any cereal. Great texture too. Please bring this cereal back! BEST cereal in the nation! I absolutely loved this cereal. Why did they quit making it? Please bring it back. I was buying the large bags at WalMart until they stopping carrying it.